Neighboring communities who once lived together in peace have committed some of the most disturbing genocidal violence in recent decades: ethnic cleansing in the former Yugoslavia; the slaughter of Tutsis in Rwanda; or Sunni-versus-Shia violence in today’s Iraq. As these instances illustrate, lethal violence does not always come at the hands of outsiders or foreigners—it can come just as easily from someone who was once considered a friend. 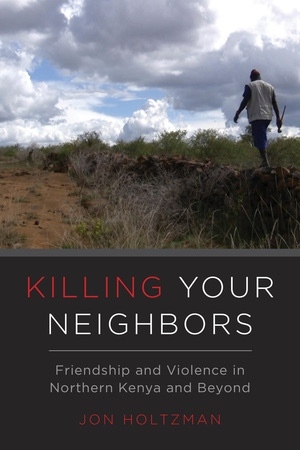 Employing a multisited, multivocal approach to ethnography, Killing Your Neighbors examines how peaceful neighbors become involved in lethal violence. It engages with a set of interlocking case studies in northern Kenya, focusing on sometimes-peaceful, sometimes violent interactions between Samburu herders and neighboring groups, interweaving Samburu narratives of key violent events with the narratives of neighboring groups on the other side of the same encounters. The book is, on one hand, an ethnography of particular people in a particular place, vividly portraying the complex and confusing dynamics of interethnic violence through the lives, words and intimate experiences of individuals variously involved in and affected by these conflicts. At the same time, the book aims to use this particular case study to illustrate how the dynamics in northern Kenya provides comparative insights to well-known, compelling contexts of violence around the globe. Jon Holtzman is the author of Uncertain Tastes: Memory, Ambivalence, and the Politics of Eating in Samburu, Northern Kenya and Nuer Journeys, Nuer Lives: Sudanese Refugees in Minnesota. He is Professor of Anthropology at Western Michigan University. 2. A Case of Testicles: Manufacturing Consent of an Ethnography of Lies? Videos by Jon Holtzman and Assistant Editor Jakob Smith.